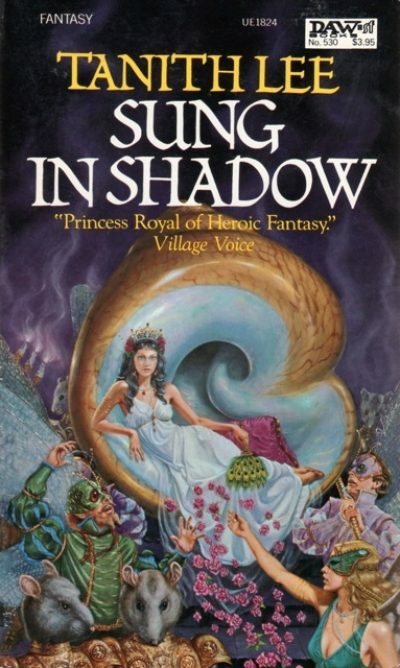 1983’s Sung in Shadow is Tanith Lee’s reworking of a certain famous play involving star-crossed, love-struck teens. I don’t know why I was surprised to discover this as I read: the play is arguably the iconic romance in English lit. It is also just as intense, melodramatic, and bloody as the best of Lee. Sana Verensa’s great families are united on one point only: that they are hate and distrust each other and engage in endless struggle for dominance and revenge. Alliances come and go while old hatreds are nursed for decades. In a city plagued by continual violence between bravos, what hope has love? Romulan Montargo lives for excess, whether in the brothels of Sana Verensa or in the streets, crossing blades with rivals from Montargo’s many enemy houses. Iuletta Chenti in contrast has always been kept carefully hidden from the world. She is of value to her father as an innocent bride who can be married off for strategic advantage. The Montargos are no friends to the Chentis; Romulan and Iuletta are an unlikely match. Of course they meet. And of course Iuletta falls for the handsome and dashing Romulan. And of Romulan falls for the fair flower of the Chenti household. And of course, of course, the malevolent Leopardo’s demons will drive him to violence at the worst possible time for the two young lovers. I never particularly thought of Mercutio being motivated by a doomed crush on Romeo, but it seems like a reasonable enough interpretation of Shakespeare; Mercutio’s creepy stalker Saffiro, on the other hand, seems to be original to Lee. You may ask how closely Lee sticks to her original model. The answer is “closely enough that anyone familiar with Romeo and Juliet (and it would be a pretty good trick for anyone in the Anglosphere not to have encountered one version or another, whether it was the Zeffirelli, the Lurman or the Man from Atlantis episode) to have a fair idea of where the plot is headed but not so closely that the author can’t pull off an unexpected development or two.” One development in particular comes to mind; at the risk of spoilers, the last four pages of this manage a swerve comparable in impact to the last few pages of Hello Summer, Goodbye1. As well as a plot that genuinely took me by surprise in places, I enjoyed Lee’s prose. Even more so than I usually do. And I usually do. Given the chronological bias of this review series, I can only assume this means the prose will keep getting better from book to book. What a pleasant prospect. Having never heard of this novel before I read it, I had no expectations. It was an unexpected delight. I really cannot find fault with this novel save for one detail outside the author’s control: there does not seem to be a legal North American edition to which I can point North Americans. British readers can at least buy this edition. 1: Which you should read if you have not yet done so.